The US hosts more international secondary school students than any other English-speaking country, and although this student population is still relatively small, it is experiencing unprecedented growth, particularly in the number of students pursuing full diploma studies on an F-1 visa. Even in Maine, we have seen our international numbers expand, with more college-bound international students than ever. And international students have unique needs in the college admission process. Evaluating prior academic work from another country, engaging parents in the process through translated materials, dealing with cultural issues surrounding college choices and majors, and advising students on English-proficiency exams—all while helping them adjust socially and academically to American culture—are among a few of the challenges faced when counseling international students. So, what to do? How do we help high school counselors and admission professionals help these students? The NACAC International Initiatives Committee members and I have designed a new workshop for high school counselors and admission officers, which will take place right before the NACAC conference in Boston in the fall. It is designed to provide insight, knowledge, and tools to better serve international students at our US high schools. I will be presenting several sessions on subjects including preparing international students and families for the college counseling process; admission and language testing; and financial matters for international students. Experienced professionals will serve as faculty. Professional organizations, such as NAFSA: Association of International Educators, will provide training on immigration and other topics. Since college admission is a two-way street, there will be a parallel track for international student recruitment and admission professionals, providing ample opportunity to network with college and university colleagues working with international students. We have even included the admission officer perspective on some of the counselor track sessions to provide insights from the other side of the desk. You will learn, for example, how the University of California, Los Angeles evaluates students when it comes to standardized testing, and how international students can effectively demonstrate interest at Trinity College (CT). 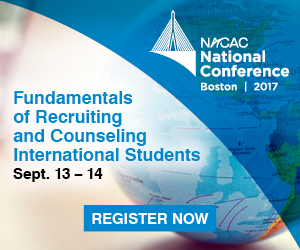 We hope that you will join us for Fundamentals of Recruiting and Counseling International Students, taking place Sept. 13-14 in Boston. Also, I invite you to check out NACAC’s free international resources. 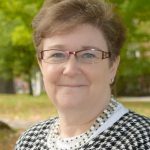 Anne Richardson chairs NACAC’s International Initiatives Committee. Beginning in July, Richardson will serve as director of academic advising and college counseling at The American School in London.